One of the earliest appearances of Boston Blackie, as created by Jack Boyle, was in The American Magazine, July 1914, in a short story entitled 'The Price of Principle'. Boston Blackie made his first screen appearance in the 1918. This was the beginning of a string of silent movies for several different studios. The first Boston Blackie silent movie, 'Boston Blackie's Little Pal' starring Bert Lytell was in the movie houses in 1918. 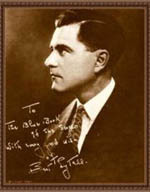 Lytell portrayed the character again the following year in 'Blackie's Redemption' which was based on two Jack Boyle stories from Redbook: 'Boston Blackie's Mary' and 'Fred the Count'. In 1922 he was played by David Powell in the silent 'Missing Millions' which was based on two Boyle stories, but another source identifies only one: 'A Problem in Grand Larceny'. Here Blackie is Mary Dawson's sweetheart; they marry at the end. The fourth silent film, 'The Face in the Fog' (1922), had Blackie Dawson portrayed by Lionel Barrymore. Mary Dawson also appeared. In 1923, 'Boston Blackie' came to the screen played by William Russell. Again in 1923, Thomas Carrigan played Blackie in 'Crooked Alley', based on the Boyle short story 'The Daughter of Crooked Alley'. Forrest Stanley played Blackie in 'Through the Dark' (1924), based on another Boyle story 'The Daughter of Mother McGinn'. The last silent, in 1927, was 'The Return of Boston Blackie' from a Boyle story in Cosmopolitan. Blackie was played by Raymond Glenn. In all these films, Blackie was a professional thief with a heart of gold. * This movie adapted from a Boston Blackie short story.